IceCube Blog is a clean, responsive light weight wordpress theme for blogging built with bootstrap. IceCube uses 2 columns along with the sidebar, the theme shows off the blog posts with masonry layout and bigger featured images. 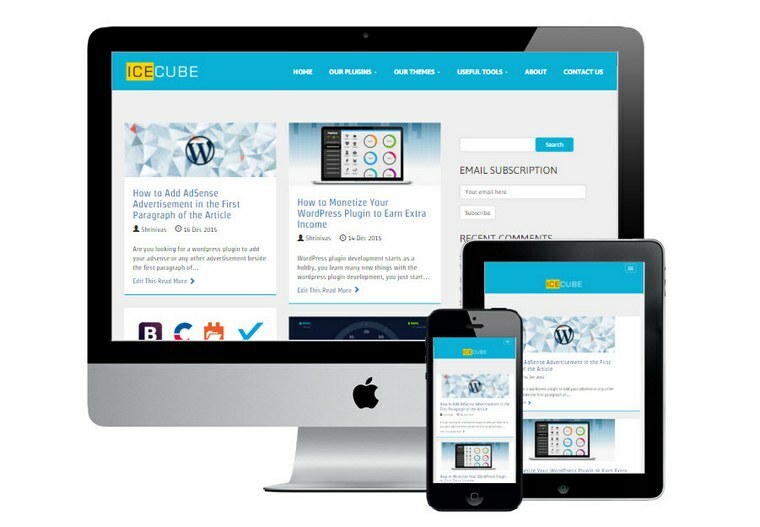 IceCube wordpress theme is perfect for your personal and business blog. IceCube Blog is the best choice if you are looking for a simple and SEO optimized bootstrap based theme for your wordpress blog. Below are the features of IceCube Blog WordPress blogging theme. IceCube is a clean and light weight bootstrap based wordpress theme with masonry layout, it is fully responsive that fits perfectly with any devices including desktop, tablet and mobile. The theme uses pre-loader on the logo and shows the article only after fully loading the content. The theme uses the best combination of margin and padding for headings for better readability, it simply enhances the reading experience of your blog. The navigation bar becomes smaller when you scroll down to the article. IceCube wordpress theme comes with a sidebar and 3 widget areas in the footer. You can add archives, subscription box, recent comments or tag cloud widgets in the sidebar and footer as per your requirements. Connecting to your social media pages from your blog is easy with IceCube theme as it let you add social media icons just before the footer. The short author bio along with the author snap is added to every article. Clicking on the author link will show all the articles of current author. IceCube wordpress theme comes with the theme settings panel which let you change the logo, color scheme, typography and many other theme related settings. The IceCube Blog theme is designed keeping better search engine optimization in mind to make your articles search engine friendly.